When hot summer days give way to cooler evenings, it’s time to fire up the grill and barbecue some fresh shrimp for a tremendous meal. Marinate shrimp for four hours in Caribbean Mango. 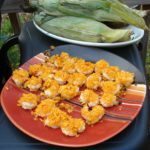 Barbecue potato chips are a key element in this shrimp recipe, and corn on the cob is a great addition. 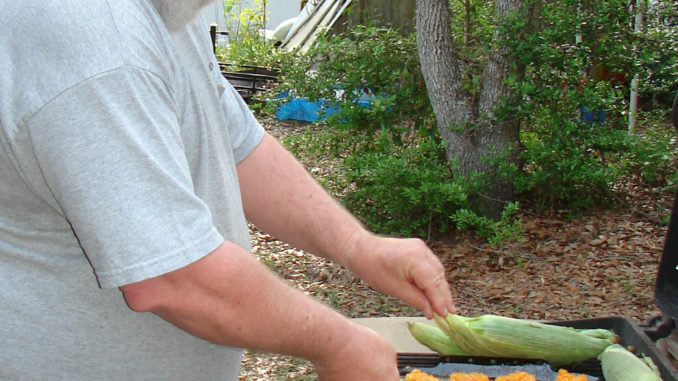 A meal of fresh, tasty seafood, especially prepared outside, is the ideal summer food, and this recipe fills that bill. Shrimp are considered by many to be the tastiest crustacean, and they tend to make a good showing during July. 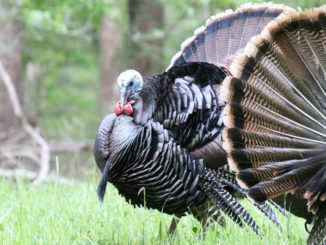 It’s is a good time to enjoy them, whether caught on your own or purchased from your favorite fishmonger, whose prices are typically pretty fair. This is a simple and tasty way to enjoy a meal of shrimp. They’ve been growing for a while deep in the creeks in estuaries and are moving out into open water and heading for the ocean. This movement is a signal that it’s time to begin harvesting some of them, and shrimpers in both states happily oblige. Every shrimp boat and seafood market will have fresh-caught local shrimp just waiting for you. As Bubba Blue so eloquently acknowledged in the movie Forrest Gump, there are numerous ways to enjoy shrimp. Whenever the weather allows, the ideal preparation involves being outdoors. That brings grills, smokers, campfires and more into play, and each outdoor gourmand has his or her preferred way of preparing shrimp. This one is a play on the idea of “shrimp on the barbie”, but introduce the barbecue flavor to the shrimp in a unique fashion. It may not replace everyone’s favorite recipe, but I’ll bet anyone that tries it will prepare it again. A word to all who prepare this is to have your favorite beverage ready before you get near the grill. 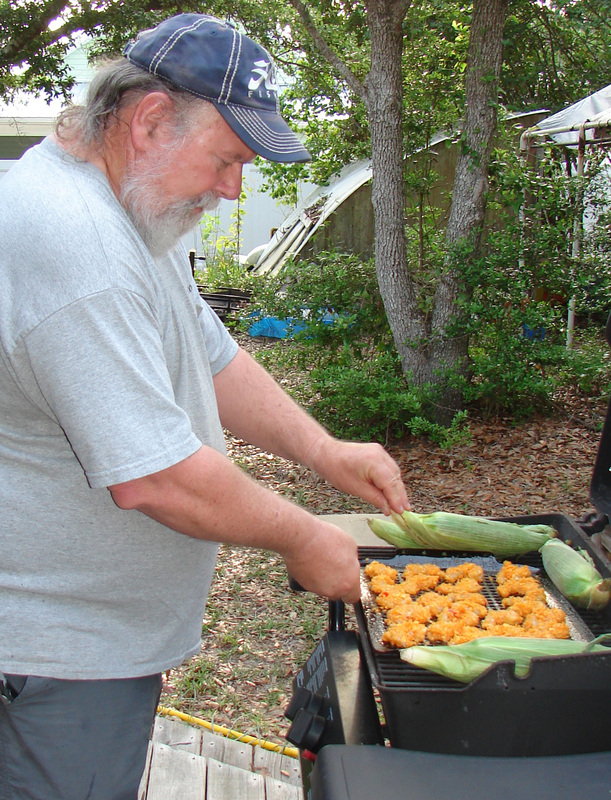 Once the shrimp reach the grill, they cook quickly and it’s soon time to eat. This recipe came to be from a “What if?” conversation. Everyone likes shrimp cooked on their grills, but it was time for a new flavor and a new preparation. This recipe is for the mildest version to satisfy the mildest palates. There are numerous ways to kick it up a notch, and I find the easiest is to sprinkle it lightly with powdered chipotle peppers. They have a smoky flavor that doesn’t overpower the mango marinade unless you get really heavy handed. I begin with fresh, local shrimp, and I don’t particularly care for the largest ones, which tend to get a little chewy when cooked. Nice shrimp, like in the 21 to 25 count (per pound) size are easy to clean — they must be shelled and deveined — make a nice presentation, hold the right amount of barbecue chips to get the right flavor and remain tender when cooked. I plan this allowing a half-pound of shrimp per person. I have done this with several mango marinades but prefer Taste of Inspirations’ Caribbean Mango. This is a Food Lion house brand and compliments its light, sweet flavor with an inexpensive price. It is pretty low in salt, and I don’t add any, but you may like a little more. I add enough coarse-ground black pepper to see a few specks, and if you would like to add ground chipotle peppers, this is the time to do it. After marinating the shrimp, add the crushed barbecue potato chips. I was a little surprised at first, but how you add them affects the flavor. If the shrimp are rolled or dredged in the crushed chips, the barbecue flavor is a little more pronounced, but the cooked shrimp aren’t as crispy. 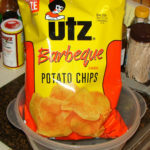 If you are going to add the crushed chips this way, I suggest crushing them in small amounts and storing them in Ziplock bags and using them one bag at a time. The marinade wets the chips, and they don’t bind to the shrimp as well after a while. I hold some of the ground chips in my hand and roll the individual shrimp in them, then get more chips when it becomes moist and doesn’t stick as well. Putting the shrimp on the grill tray and sprinkling them with the crushed chips keeps them crispier, but the barbecue flavor isn’t as pronounced. It doesn’t get into the marinade and flavor the shrimp while they are cooking but is an external flavor. One thing to remember is that all seafood dishes are best with fresh seafood, especially if caught the same day. TIP: If you like your barbecue shrimp crunchy, pull them off the grill and finish them by broiling in the oven for about two minutes. Peel and devein shrimp. Salt and pepper to taste. 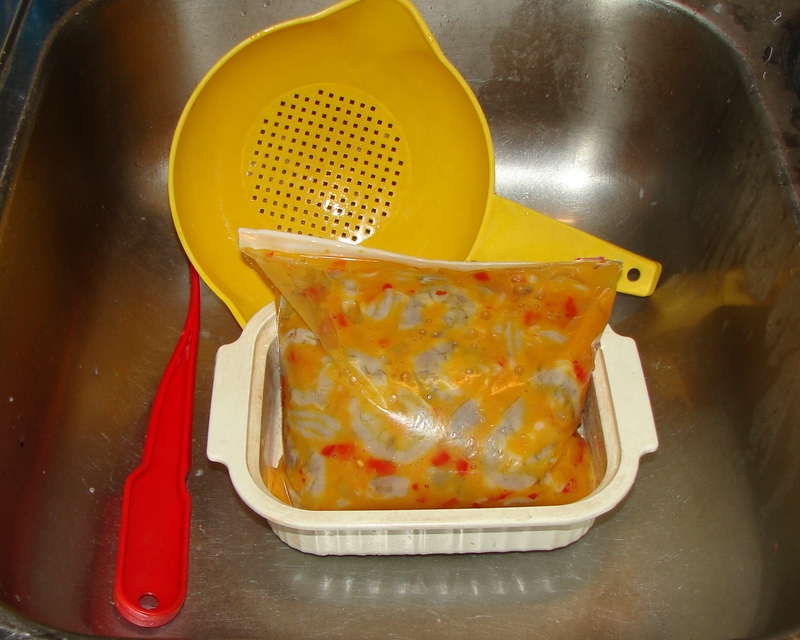 Put shrimp in zip lock bag and cover liberally with Caribbean Mango marinade. 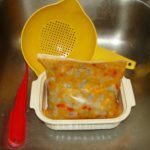 Allow to marinate in refrigerator for 4 hours. Preheat grill to low/medium. My grill is a bit hot, and this works well on low. 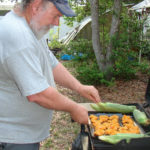 Put corn on grill in husks. It needs to cook 10 to 15 minutes depending on grill temperature and to be turned halfway through. 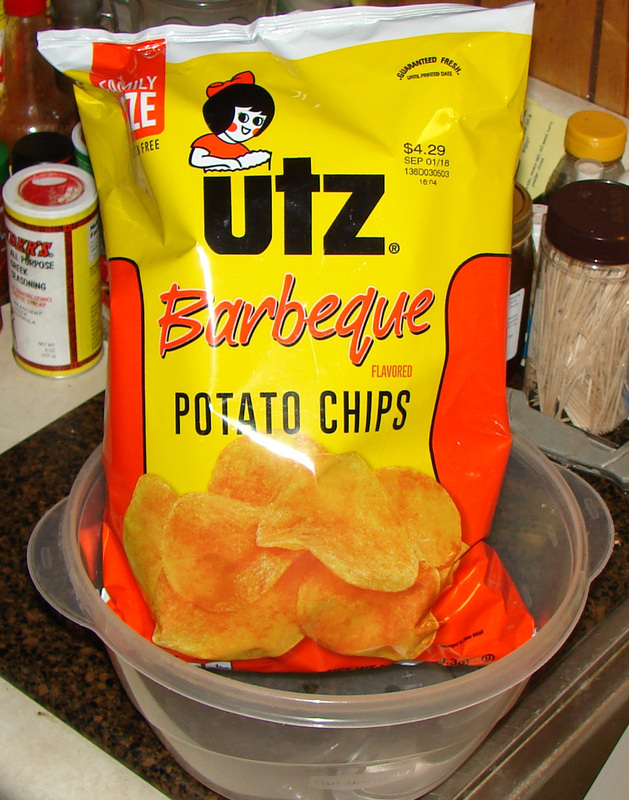 Crush the potato chips finely, but not to powder. Spray the grill tray with non-stick cooking spray. This is where you decide if you would like this with more crunch or spicier. For a spicier taste, pick up a little of the crushed potato chips and roll each shrimp in it before putting them on the grill tray. 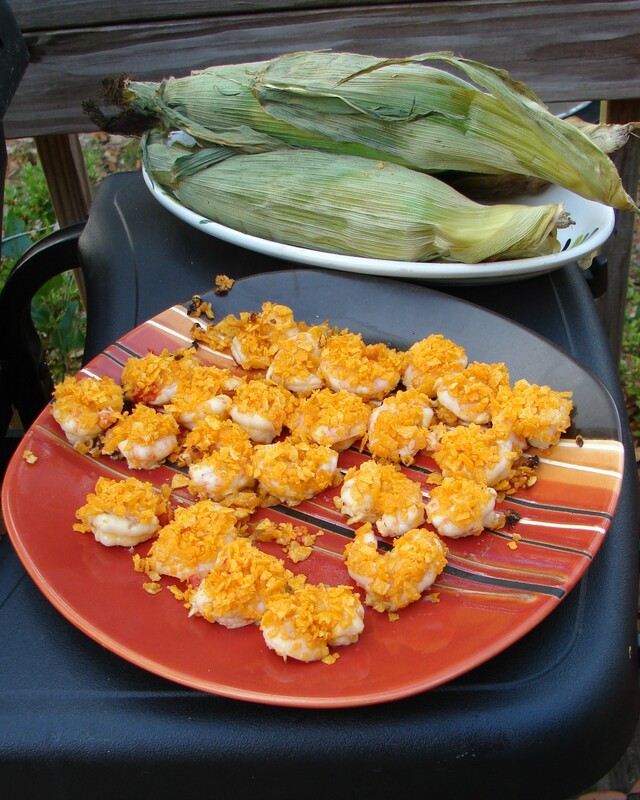 For a crunchier taste, arrange the shrimp on the grill tray and then sprinkle them with the crushed potato chips. Cook 3 to 5 minutes, depending on grill temperature, and do not turn. Do not overcook. The little parts of the shrimp you can see will turn reddish pink when it is ready. Don’t be afraid to taste one to check how well it’s done. That’s the reward for being the cook. If you want the crunchiest shrimp possible, this is the time to remove the not quite done shrimp from the grill and finish them for a couple of minutes under the broiler in the oven. I serve this with grill roasted corn on the cob and creamy rough cut slaw. Some of my friends like dipping sauces. I don’t care for cocktail sauce with this, but it works with tartar sauce and sriracha sauce. For tartar sauce with a little more spice, but not the heat of sriracha sauce, mix some tartar sauce with your favorite hot sauce.